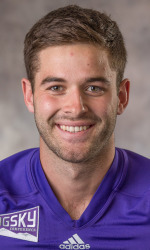 Blake O’Neill is a punter for the University of Michigan’s football team. He is from Australia and is in school for a second Masters degree at the university. Several times during the game between Michigan and their arch rival Michigan State Blake was asked to punt his team out of trouble. Each time he came up with great punts which set Michigan State back. One time his punt flew and rolled 80 yards! Three times he pinned State deep inside their own 10 yard line! Although Michigan State had a clear advantage in yards gained, they found themselves losing 23-21 as O’Neill was punting to them again. A big reason Michigan was ahead was because Blake kept making them drive the long field with his booming punts. His punt was booted so high that State could not return it. Right then the announcer mentioned that Blake O’Neill was one of the stars of Michigan’s effort that day! Nobody saw the change in fortunes that would follow. Mark Dantonio the Michigan State coach told a story after the game about what happened on the team bus before they walked into the stadium. “I want you all to take 10 seconds and think about what might happen”, he said. Then he started counting down the time until the 10 seconds had elapsed. Quickly they exited the bus and put their minds on the task at hand. Little did they realize the irony of what just happened. My son and I were sitting on the couch watching the game unfold. Michigan State made an effort to move the ball. They only needed a field goal to take the lead. However Michigan’s defense stiffened and with just under 2 minutes to go State threw an incomplete pass on 4th down. State had only one time out and it looked like they were finished. Michigan methodically ran the ball and State used their last time out. After 3 plays and the clock running Michigan was able to run all but 10 seconds off of the clock. On fourth down they didn’t hesitate on the play call. They sent Blake O’Neill on the field to punt one more time. 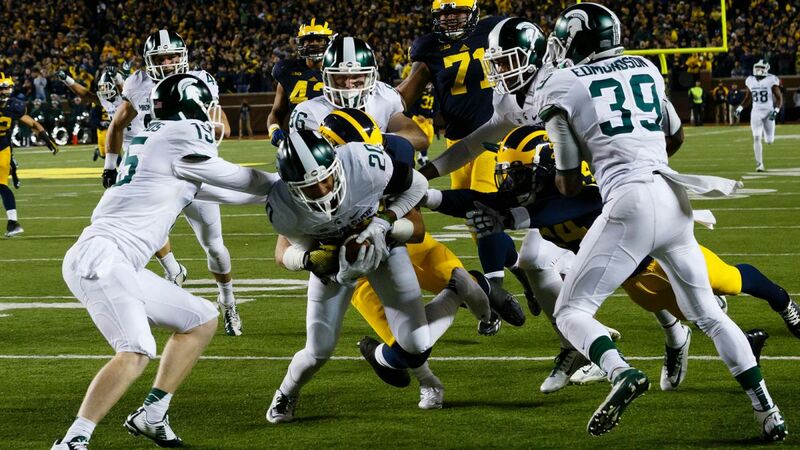 Michigan State in desperation put their entire team on the line. Their only hope was to block the punt. Knowing the rush was coming I’m sure Blake was in a hurry up mode. The snap came back to him around knee high. Ideally the snap should be around chest high so the punter doesn’t have to reach. Blake reached down for it and the ball hit off of his hands and dropped to the ground. Quickly he picked it up and attempted to punt but the State players were on him and the ball bounced crazily in the air. Suddenly a Michigan State player named Jalen Watts-Jackson had the ball and was running for the end zone with a convoy of State players in front of him. Jalen is a red shirt freshman on the State team. He had to be as surprised as anyone when suddenly he had the ball in his hands. Knowing that if he was tackled the game was likely over he pressed on behind his convoy. 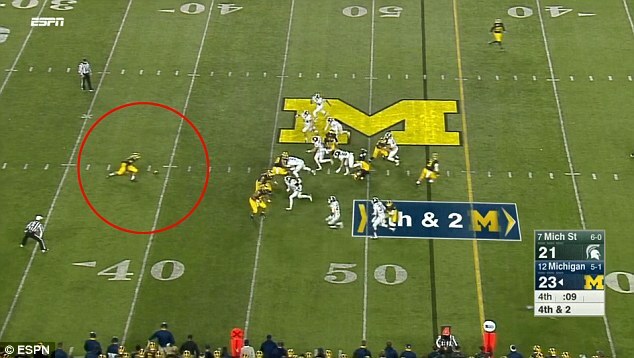 Michigan players tried desperately to reach him but to no avail and he dove into the end zone. Somewhere between diving into the end zone and his excited teammates diving on him Jalen was hurt. He laid on the end zone turf in serious pain. It was discovered later that Jalen had broken and dislocated his hip. He was carted off of the field and transported straight to the hospital. Surgery was performed the next day and Jalen’s season came to an end. My son and I were rooting for Michigan State but we were watching in amazement instead of any kind of celebration. When Jalen Watts-Jackson crashed into the end zone finishing the game my son made a statement that made me realize that I was a successful parent! “That poor punter” he stated as he realized what that kid was going to have to live through. It brought me out of my amazement daze and made me take note of what he was saying. At that moment we took our minds off of the game and the score and rested them on the punter. Obviously Blake O’Neill felt worse than anyone. The cameras were showing pictures of stunned Michigan fans in the stands and yet the most stunned person of all had to be O’Neill. Time after time they kept replaying the victorious or disastrous play depending on your point of view. Isaiah Thomas the hall of fame ex Detroit Piston basketball player watched the ending of the game from his couch. It brought back memories of when he made a bad split second decision that would cost his team the Eastern Conference Finals victory in the playoffs. With 5 seconds left and his team ahead by one point Isaiah attempted to throw the ball in bounds to his teammate Bill Laimbeer who was near the opposing basket. Hurriedly he threw the pass only to have Larry Bird of the Celtics knife through the lane and grab the ball. A second later he was passing to his Celtic teammate Dennis Johnson who laid it in the basket. Isaiah was in misery because he felt like he let his team and their fans down. He was the leader of the team and yet he made this horrible blunder. In the years ahead Isaiah would lead the Pistons to back to back titles. Much of the pain for his blunder had passed and yet seeing Blake O’Neill’s blunder brought it all right back. There were two hurting people on the field at the end of the game. There was the Michigan State freshman Jalen Watts-Jackson who was laying in the end zone in pain. Then there was Blake O’Neill who was suffering from a pain of another kind. It was an emotional pain as his last minute miscue overshadowed all of the good he had accomplished previously. Medical people tended to Jalen and he received the operation that he needed to mend his body. Isaiah Thomas reached out to Blake with a phone call. He told him of his experience with the last second blunder he made and how that in time it all will pass. In the immediate aftermath of the game social media was running rampant. There were many tweets that were very unkind and even death threats to Blake. Then to the credit of many there were tweets of support for the fallen punter. Blake vowed to carry on when he broke his silence a few days later. Jalen vowed to make a full recovery from his injuries and return next season. It’s easy to fault someone on the big stage for mistakes that they make. In reality we all make mistakes. The difference is that our mistakes are not performed before 110,000 people plus millions on TV. Mitch Albom wrote an article in the Detroit Free Press praising the quality of students and school representatives each of them were in their reactions to what happened. Quietly I admired my own son who recognized that the outcome of the game wasn’t nearly as important as the pain the punter was experiencing. Somehow whether through us or on his own he had acquired the gift of compassion. The world would be a much better place if we all felt compassion for others too! The year was 1975 and Tommy John a pitcher for the Los Angeles Dodgers was throwing a baseball over and over against a wall. This was a drill that was part of his rehabilitation treatment. Each day without variation he took five baseballs out and threw them one by one as hard as he could over and over again. Each day he felt discouraged as the velocity of his throws wasn’t improving. It was during 1974 the year before that John was having his best pitching season. Just before the all star break he was leading the league in wins with 13 against only 3 losses. His career had been resurrected since he joined the Dodgers in 1972. He started putting together winning seasons and 1974 was his best yet. Then when least expected as he was at an all time professional high, his pitching world suddenly seemed to come to an end. On July 17, 1974 John was pitching against the Montreal Expos. With two runners on and one out he hoped to throw his sinker in such a spot to get an inning ending double play. As he threw the pitch his arm went limp and the ball floated softly outside. Tommy could tell something was horribly wrong. He attempted another pitch with the same results and motioned for the manager to come out. “You better get someone else in here”, he said as he conveyed that he couldn’t go on. Dr. Jobe, the teams physician advised Tommy to rest his arm and ice it down daily. This seemed to be the perfect remedy. Three or four times in the past Tommy had hurt his arm or shoulder and rest helped his body perform the healing. He was not in favor of an operation if he could avoid it. After a month of rest and his team thick in the pennant race they were anxious for John to return to the mound to give them the boost they needed. His arm felt so good that he attempted to throw batting practice. When he threw the first pitch his arms strength was noticeably missing as the ball bounced in front of the plate. The trainer taped his elbow for support and that improved his throwing but the velocity was way down and his ball movement was lost. He told his manager that he was done for the season and called Dr. Jobe. “I want you to operate on my arm”, he pleaded. It was a decision that Tommy had thought long and hard about. Knowing that rest was not helping it seemed like the only logical option available. When Tommy woke up from his operation he noticed that not only was his left elbow bandaged but his right wrist was too. Dr. Jobe explained the unusual procedure he had administered. The tendon for his left elbow was so worn down that there was nothing left to work with. A replacement was needed and he came up with the procedure of using the tendon in Tommy’s right wrist. Dr. Jobe had transferred tendons before but not from wrists to elbows. This was an experimental operation that would help Tommy live an everyday life but it was unknown if his arm could ever throw a baseball the way he once did. The rehabilitation process would be a bunch of strengthening exercises that included the wall exercise. As Tommy was throwing against the wall every day he repeated a Bible verse that he loved over and over. Luke 1:37 “For with God nothing is impossible.” He stated how it was almost a symbolic thing he faced every day. The wall represented the physical wall he was trying to break through. The wall was physically in front of him symbolizing his obstacle, and yet he needed the wall there to get to where he wanted to go. Tommy took all of the 1975 season to rehabilitate his arm. Working every day on strengthening his grip and his elbow with special exercises. Over and over throwing baseballs against the wall until he tired and couldn’t continue. It was hard but gradually strength came to his arm and elbow. Clinging to his faith that with God nothing is impossible, he gained strength with the slightest improvement. Throughout 1975 he kept the faith believing that truly nothing is impossible. Every little improvement made him work all the harder. When setbacks occurred he clung to his faith that the next time things would be better. Amazingly in 1976 Tommy John pitched 207 innings! His comeback was hailed all around baseball as a miracle. During the next five years he won 20 or more games three times! His professional success had taken a turn much like a falling rocket suddenly finding it’s thrust and reversing it’s course and speeding upward! It was at this monumental time in his life that he was hit with a blow that literally brought him back to his knees. It was a day that Tommy John would remember for the rest of his life. On August 13, 1981 Tommy received a phone call while in the bullpen. “Tell them I’ll call them later”, was his response. It was disclosed to him that it was his wife Sally and she said it was an emergency. Tommy learned that one of his three children the youngest named Travis had been seriously hurt. Playing by the window of their vacation home three stories up Travis age 2 had fallen out of the window and hit the bumper of a parked car. Sally hearing the news from one of the other siblings rushed to rescue Travis thinking that maybe he broke his arm, then realizing that it was a three story fall. Travis was rushed to the emergency room as he was unconscious and in dire straits. Tommy hurriedly dropped everything and rushed to get to his family. Day after day Tommy sat in the hospital room with his son. Because of his baseball status people from all over the country sent him letters of encouragement. He did not go on the road with the team but took a break from the hospital room to pitch home games when his turn came around. Most of the time he sat there hoping for a miracle for his son. As the letters poured in he started reading them to his comatose son. It was like that wall was in front of him again. He had heard that his son could possibly hear him but couldn’t respond. Carefully he removed letters from their envelopes and read to Travis. This letter is from Mrs. Mary Fletcher of Dallas Texas he might have said. She has been a long time Dodger fan and is praying for Travis. Over and over he read letters sitting in that hospital room. He found comfort in knowing that people cared enough to reach out. It was unknown if Travis would make it. Three weeks after the original accident Tommy John’s miracle happened. Travis opened his eyes! Joyfully each day got better and one day it was time for Travis to go home! Miraculously he had no long term effects from his fall and has lived a normal healthy life since! Tommy John pitched in the major leagues until he was 46 years old! Amazingly at an age when his peers had long since retired Tommy was able to keep getting major league hitters out. Today thousands of people have had the surgery that he had. In fact they have named the procedure “Tommy John Surgery.” People throughout the world know his name through this even if they don’t know who he was. His surgery is responsible for useless pitching arms becoming useful again! Like Tommy John you may have a wall in front of you. Not all walls fall down so that we can walk through similar to the red sea parting. Sometimes the wall remains and we have to go over or through them. God doesn’t always answer our prayers the way we want them answered. He loves us and works everything for our good if we truly trust him. Just as Tommy John put his faith and pitching future in the hands of a doctor and an operation, God is operating on us too. He is equipping us with new strength as he transplants his loving spirit to fill our needs. The wall that Tommy John was throwing the baseball against was necessary. It was a way for him to gain strength. God allows walls in our lives to strengthen us too. When a wall is in front of you rejoice knowing that good will come out of it! Remember that nothing is impossible with God!